Flea and tick prevention has been a huge topic lately. It’s clearly quite important to us since we want the best for our pets. I asked Ben, Sweep Tight contributor and vet tech at Southwest Animal Care Center, to share his experience. Yes, this is to scare you into using flea and tick prevention. It’s a real problem that needs prevention. This post is brought to you by K9 Advantix. All opinions are our own. I can’t count the times I’ve advised clients to use flea and tick prevention. I also can’t count the times that clients have said, “No thanks. He’s fine,” or, “He doesn’t go outside that often.” Let me just say now that not going outside “that often” is not the same as never going outside. 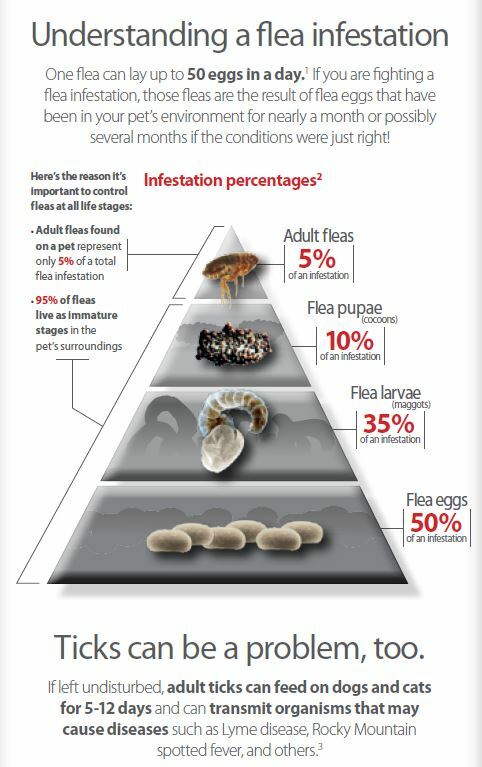 So what’s the worst that can happen if your animal isn’t on flea and tick prevention? A few ticks? You can just pull them off. A few fleas? No problem. Fleas can infect your animal with tape worms. That’s bad in itself, but if you have children it’s even worse. Tape worms can be transmitted to people. How many times have we told our children to get their hands out of their mouths? There you go. All a child has to do is touch the family pet. If that fido has tape worms, the tape worm eggs which have shed through its stool can be on his fur. So when a child’s hand goes straight into his or her mouth… well, it’s not good. Fleas can also cause allergic dermatitis. This is a condition in which your pet’s skin becomes red and inflamed due to an allergic reaction to the flea’s saliva. If it continues on unaddressed, it can lead to severe reactions causing flaking, greasy, smelly skin, and hot spots due to the animal chewing and scratching at the irritated area. Ticks are no better. They transmit lyme disease. Lyme disease can be a painful proposition for pets. It causes severe joint pain, lethargy, inappetence, and listlessness. It’s not deadly, but it can certainly make your pet look like it’s dying. Flea and tick control isn’t the cheapest thing in the world, but its definitely one of the more kind things you can do for your pet. We’ve all heard it – more than once. “Is your pet on flea and tick medication?” It’s a question that’s asked every time we take our animals to the vet. Well, as a veterinary assistant, I’m going to give you a real life example of why we always ask that question. We have an adorable little Shih Tzu that comes to our clinic. He’s a nice dog, but his owner is, shall we say… less than diligent about giving him his flea and tick medication in a timely manner. One day, said client brought in her dog and said that he was shaking and acting jumpy. She couldn’t figure out why, and she asked if there was anything we could do. We said yes, and the doctor came in to look him over. Without any exaggeration, within thirty seconds, both the doctor and I had fleas all over our arms and torso. That poor dog was quivering because he was so uncomfortable! His skin was red and inflamed. He was miserable. After giving him an oral dose of a powerful flea killing medication, we counted around 100 fleas before we gave up on it. The dog had been infested for weeks, suffering from inflamed, itchy skin, and it was 100 percent preventable. Please, give your pets flea and tick preventative. With topical prevention like K9 Advantix II, your dog can safely frolic around this summer without having to worry about flea and tick infestation. The monthly applications are easy to apply and well worth the peace of mind to know that your pet is protected. I live in a wooded area and ticks are a real concern for me. For our dog and us humans! I have had two ticks so far this year. I just HATE them! I remember getting a tick years ago, it was horrible! Getting them is so dangerous too, there’s been such an increase in Lyme Disease! I always feel so bad for dogs that have a flea and tick problem. You’re right, it is a horror/nightmare. My mom uses this on her dog. Oh the horror of having pets! Yes, it is so important to protect them against fleas and ticks because not only is it bad for your pet’s health, but your own health as well! You are so right that prevention is key! We use flea and tick treatments but it’s the prevention that makes life easier – if they don’t have fleas or ticks, there’s no infestation to treat! I had a black dog when I was little and he always had fleas in the summer! Ugh…. When I had a white dog, he never had them. Not sure if there is something to that? Anyway, prevention is so important. Glad they have Advantix. Oh my gosh, I hate ticks..they are so gross!! I protect my little pooch too with a similar product! These are so aggravating! This is the same product we use for Gino! We LOVe our chocolate lab and always do our best to protect against fleas! I think it’s gross how fast fleas can reproduce…yuck! That graphic is disturbing!! 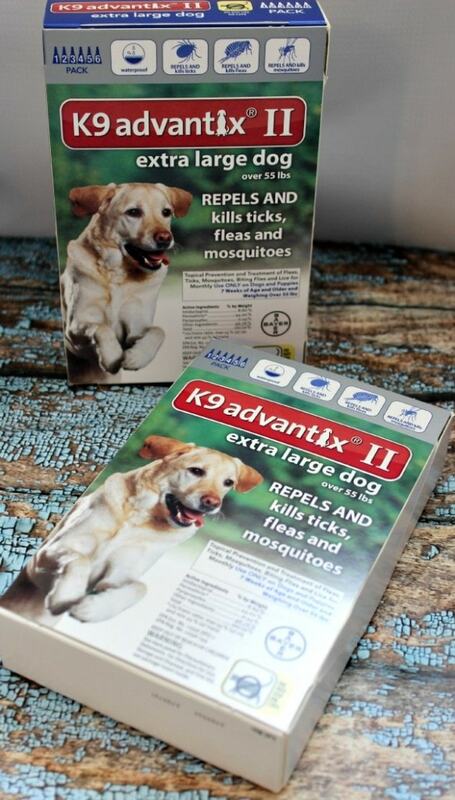 I am so glad that K9 Advantix can repel mosquitos too because we have a lot of them here in Illinois and I dont want my dog to deal with that. Yuck yuck yuck. I absolutely hate ticks. We’ve luckily been spared for several years now that the neighbors took care of their infestation. They can get so bad, it is always good to treat before their is trouble or notice of fleas or ticks! We use a different brand, but I think we need to look at Advantix because it repels mosquitos, too! Our Mini Schnauzer suffers with them too. We keep her groomed and protected. Can’t have a family member suffering. We have a cat who is severely allergic to fleas. We do our best to keep her protected, because if fleas get a foothold in your home you can never seem to completely get rid of them! GROSSSSSSSSSSSSSSS! I remember when I was a kid we found a stray cat which we kept and she was infested with fleas, they are so hard to get rid of.We do not have any animals ourselves because of my daughters allergies but this sounds like a great product. Our last dog had a big flea problem. It was horrible and it took forever to get rid of them. Ugh! Fleas and Ticks are the WORST!! Prevention is the key b/c they are so hard to get rid of! Thanks for sharing! We’ve had to deal with fleas with our pets before and it is no fun at all. Okay you’re totally making me rethinking letting my kids roll down our hill on the grass. ugh! We’ve already found one tick on our son. so gross! This is a very important preventative measure. Ticks can be so dangerous to both humans and animals. Oh fleas and ticks just gross me out!!! I hate how many bugs there are in summer. Great tips to prevent a flea problem! We had an issue with fleas and I went crazy cleaning everything and was able to get rid of the pretty quickly. I lived in an apartment right after a pet owner moved out, and I had to deal with the aftermath of a flea infestation. I didn’t even have pets! Flea horrors are real. Wow, prevention is definitely key! Fleas, ticks and then the possibility of tapeworms? Yikes. We always give our pets flea and tick preventatives, it is very important. We want to make sure they are safe and most of all happy.